Phnom Penh, June 2018 – With the goal of enhancing flood and drought information for a more climate-resilient agriculture sector, the UN Development Programme has this month launched a tri-partite collaboration with Cambodia’s Ministry of Agriculture, Forestry and Fisheries and Bangkok-based SERVIR-Mekong. Under the new partnership, SERVIR-Mekong will help Cambodia step-up drought information using specific local indicators. The partnership was initiated under ‘Strengthening Climate Information and Early Warning Systems in Cambodia’, an ongoing project implemented by Ministry of Water Resources and Meteorology with support from UNDP, aimed at linking climate information with agriculture, including establishing a drought information service in the country’s drought-prone provinces. 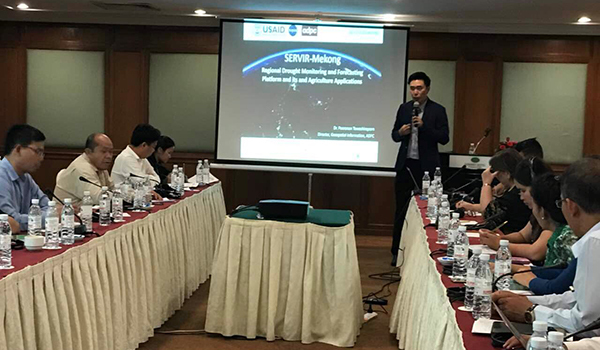 As part of the global SERVIR service supported by NASA and the U.S. Agency for International Development, SERVIR-Mekong seeks to streamline access to data and imagery from satellites so information can be integrated into tools and models accessible to countries like Cambodia. Earlier this year, SERVIR-Mekong launched the integrated web-based information tool ‘Regional Drought and Crop Yield Information System’ for the lower Mekong region. The tool is intended to improve operational, technological, and institutional capabilities to prepare for and respond to droughts in the region; and support local decision-makers in drought monitoring, analysis, and forecasting. This regional forecast tool can provide policy makers with the current and forecast drought indices that can be adopted in Cambodia. At an inauguration event in Phnom Penh, June 6, Secretary of State and Head of the Climate Change Technical Working Group at the Ministry of Agriculture, Forestry and Fisheries, H.E. 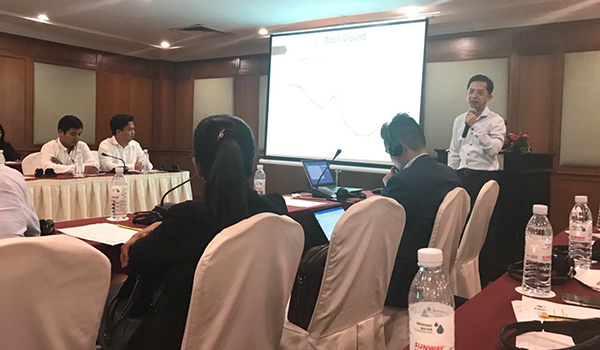 Dr. Ty Sokhun welcomed the new collaboration with SERVIR-Mekong, emphasising the clear need for specific climate information in informing agricultural practices in Cambodia. 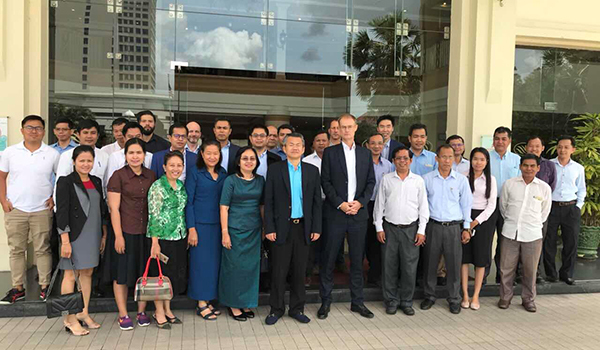 UNDP Country Director Nick Beresford said SERVIR-Mekong’s services and technical assistance would open up further avenues for more innovative approaches. UNDP Project Manager Dr. Usamah said strong trust and collaboration among relevant agencies remained key to achieving more reliable forecasting and early warning, both for disaster preparedness and response, as well as for agricultural planning. Dr. Peeranan Towairaphorn, Chief of Party of SERVIR-Mekong, commended the initiative of UNDP Cambodia with the Ministry of Agriculture, Forestry and Fisheries, and presented how, after the event, a mechanism for supporting decision-makers in Cambodia on drought monitoring, analysis and forecasting will been developed. This is a bridge that the early warning systems project of UNDP Cambodia will take further, localising it to a Cambodian context. On behalf of UNDP Cambodia, Dr. Usamah also expressed appreciation to stakeholders for the initiation of a data-sharing mechanism, for climate information and early warning systems, between EWS1294, Mekong River Commission and the Ministry of Water Resources and Meteorology, as well as other technical services. 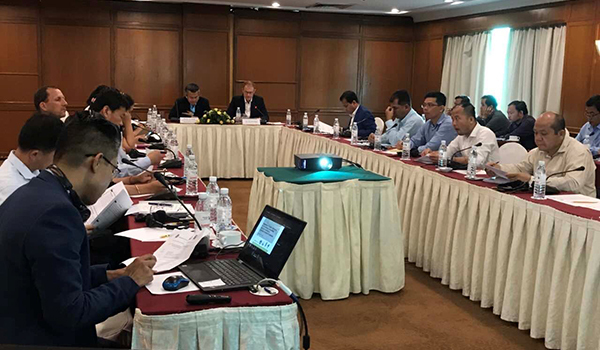 He said information provided by the weather and hydro stations set up by UNDP and the Ministry of Water Resources and Meteorology, could complement and triangulate information provided by SERVIR-Mekong. Cambodia is among the world’s most disaster-prone countries, in particular suffering from recurring drought. Since 1980, the country has experienced drought around 17 times, including the 1982-1983 event related to a very strong el-Niño, which led to significant losses in agricultural production and extensive food shortages. Widespread drought in 2016 directly affected 2.5 million people and indirectly impacted the whole of the country. As Cambodia experiences longer dry seasons and shorter, more intense rainy seasons, the risks for development are acute. Cambodia’s economy relies heavily on agriculture, fisheries and forestry – collectively the sectors constitute approximately 34% of gross domestic product. Around 85% of households depend on these sectors for their livelihoods. 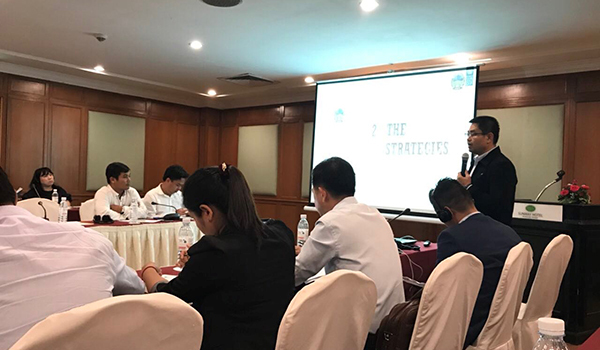 Financed by the Least Developed Countries Fund, the project ‘Strengthening Climate Information and Early Warning Systems in Cambodia’ is a multi-year initiative supporting the Royal Government of Cambodia to advance climate information and early warning systems. Among the key activities of the project is installing and re-activating existing Automatic Weather and Agrometeorological Stations and Automatic Hydrological Stations across the country and the provision of climate bulletins for farmers. H.E. Dr. Ty Sokhun, Ms. Mom Thany, Under Secretary of State at the Ministry of Agriculture, Forestry and Fisheries were among the participants of the one-day workshop, along with other officials from MAFF, UN agencies and international NGOs. Technical officials from the Ministry of Agriculture, Forestry and Fisheries joined UN agencies and international NGOs at the launch event on June 6. Here H.E. Dr. ty Sokhun and Mr. Nick Beresford present expectations of outputs. Dr. Peeranan Towasiraphorn presenting the SERVIR-Mekong drought information portal and its adaptability in Cambodia. In 2016, the Ministry of Agriculture, Forestry and Fisheries established the Climate Change Priority Action Plan (2016-2020), here presented by Mr. Prak Amida. Among the plan’s 33 priority actions was the introduction of climate-smart practices based on climate information and weather forecasting, as part of climate change adaptation in the agriculture sector.